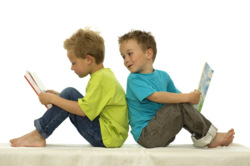 Are you looking for literature to support classroom instruction about Friends & Friendship? Check out Our Editorsâ Choices for titles recommended by the Education World team. Then it's your turn to share books that you enjoy or use in your classroom in the Our Readersâ Voices section below. With your help, we will build the best list on the Web of Best Books for teaching about Friends & Friendship. Lola is excited because she is going to spend the afternoon with Morten, the little brother of Charlie's best friend. She has planned an afternoon with fun and games, but her hopes are dashed when she discovers that Morten is so shy he won't even speak. Lola tries everything she can think of, but nothing does the trick. "What a nice story of trying to make someone happy and then doing something they like to do that you don't really like to do because you know it will make them happy," wrote one reader. Part of the Charlie and Lola series. The inspiring true story of two great friends, a baby hippo named Owen and a 130-yr-old giant tortoise named Mzee (Mm-ZAY). When Owen was stranded after the Dec 2004 tsunami, villagers in Kenya worked tirelessly to rescue him. Then, to everyone's amazement, the orphan hippo and the elderly tortoise adopted each other. Now they are inseparable, swimming, eating, and playing together. Here is a joyous reminder that in times of trouble, friendship is stronger than the differences that too often pull us apart. A stunning young-adult novel by Rodman Philbrick that tells the heartwrenching story of two "special ed" boys who pair up to form a unique and empowering friendship. The two boys -- a slow learner stuck in the body of a teenage giant and a tiny Einstein in leg braces -- forge a unique friendship when they pair up to create one formidable human force. Made into the film, The Mighty. What if a dinosaur's friends come to play? Does he pout if he can't get his way? Does he hide all his dump trucks, refusing to share? Time and time again, children are told to "play nice." This brilliantly illustrated board book is packed with rhymes that will teach children how. It will show them that "playing nice" can be easy and fun. Perfect for parents to read aloud with their children, this book is as humorous as it is instructive. Add your voice to our list of books for teaching about Friends & Friendship! The Education World Editorsâ Choices above represent just a handful of the fine books that might be used to support classroom instruction about Friends & Friendship. Now weâre waiting for you to add to our list! Simply send us your review of a favorite book in 100 words or fewer and we will add it to the Readersâ Choices below.